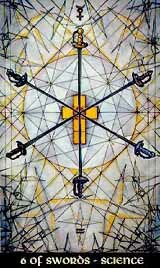 In the beautiful harmony of Tiphareth, the Six of Swords have overcome the crisis of the Five, the emotional wounds are healed and the element concentrates on its origin potentials, its very own powers and qualities. In science i.e. any fields of deeper thinking, the mind can unfold all its energies, and the restless Swords have the chance to combine the mind with the mental spirit from which it was born, to achieve a perfect harmony of it all.